These lines of Jack Spicer’s from his poem Imaginary Elegies sum up for me the job of the historian, and the care we need to take when we conjure the dead through our damned medium: our damned medium being history. A poetic expression of EP Thompson’s famed rallying call to rescue people from the condescension of posterity, it also acknowledges that when historian’s conjure up the dead, in whatever fashion, they make noise again where there has since been silence. Like many European capitals, the sheer wealth and depth of the history that courses through the streets of Prague can be overwhelming for the visitor – from the remarkable architectural heritage to be found at places like Vysehrad, St. Vitus’ Cathedral, the Charles Bridge and the Waldstein Palace to the seemingly endless public statuary that reminds one constantly through works that are sometimes simple and other times monumental in every sense, of the long deep history which the streets of the city have had to bear from Hussite Revolution to Fascist invasion and much more besides. In that respect, Prague can like so many great cities, seem to be drowning in its own history and the competition moreover of each of these different facets of the city’s history to interest and intrigue the thousands upon thousands of tourists wending their way through Old Town past the sellers of knick-knacks and tack. But as with all cityscapes which are teeming with the weight of so much history, pulling you in different directions and through centuries as you turn from one street to the next, crossing one set of tram tracks at the end of a square to turn on to another, there is also the presence of how silent those pasts can actually be, despite this noisome melange. What turned my mind to the notion of silence was a number of exhibitions I viewed on my most recent trip to Prague. At the DOX, the contemporary art gallery, there were three particular exhibits that upon reflection had something vital to say about history and silence. The three exhibitions of which I am thinking are the poster as propaganda, 1914-2014, an exhibit of various samizdat publications and finally an exhibition of the Chinese photographer Liu Xia. Reflecting on all three of these exhibitions as I saw them together under the one roof, the theme of silence (especially imposed silence), especially strong in Liu Xia’s work, struck me as equally important to the other two exhibits as well. The enforced silence of Liu Xia, under house arrest since her husband won the Nobel Peace Prize in 2010, is a silence that must no doubt resonate deeply and strongly in Prague, a city where silence under the Nazi and Communist regimes was a part of everyday life. With every visit to the city, you become more and more acutely aware of all that has passed on its streets and squares. The different exhibitions that I saw at the DOX each taught me something important about how to understand the history of the Czech Republic and its capital. The first exhibition on the poster as propaganda tool was a fascinating sweeping history of the twentieth century in central Europe first but gradually widened out to consider other global struggles and revolutions, the onset of globalization, the war on terror and the recent crisis of late capitalism. What struck me as particularly interesting was the periodization of the exhibition. Periodization is a vexed issue at the best of times for historians but the lay out of this exhibition was particularly interesting in terms of the periodization that was employed. Some standard periods were employed such as 1918-1939, but it was towards the post Second World War era that things got interesting in this regard. There was no periodization from 1945-1968, as one might have thought given the shift that was caused by the Prague Spring and its aftermath, or from 1968 to 1989 and the Velvet Revolution – instead the exhibition went with the far broader brush stroke of 1945-1989. Perhaps this was to indicate the wider battle between both sides in the Cold War. Yet, for the Czech people that broader period is probably best understood in terms of the Soviet takeover in 1948 until the Prague Spring in 1968 and from the subsequent “normalization” period that followed until the emergence of Charter 77 and then the Velvet Revolution. The silencing of these two distinctive periods in Czech history meant that the exhibition was to be understood by those who saw it in this much grander narrative, but robbed the viewer of the nuance that a more atomized periodization would have provided. One of the more striking posters displayed was a Czech poster imploring people not to forget Lidice, a town carpet bombed out of existence by the Nazis in retribution for the assassination of Reinhard Heidrich. Film footage of the town’s destruction was powerful but so too is the knowledge that all official records of the town were destroyed by the Nazis in an attempt to eradicate, to silence, this place out of history. This was a violent kind of censorship, an important theme that carried over elsewhere in the gallery and in particular in the exhibition of Liu Xia’s photography. Here again in the samizdat publication we see a kind of silence that was brought on by the effects of normalization – the retreat from public life into the private world and what Tony Judt has described as “pro forma political conformism”. It was in this private rather than public world that samizdat publications circulated. The weird state of difference between one’s public face and private opinion has recently been examined by Paulina Bren who asked “what then was ‘normal’ about normalization? That nothing, and yet everything, was normal was hinted at by ordinary citizens’ own adoption of the term…” In such a world, and again as Bren notes, in a world where whats passes for normal is a state in which there is nothing happening, then the silent, covert writing, publication and reading of samizdat work becomes an important whisper in an otherwise silent society. It was in precisely this context which Czech action art emerged. As Pavlina Morganova has recently written of early Czech action art, its function was as “a public performance and an attempt to penetrate the routine lives of other people.” In other words, an attempt to break the silence, the stillness, imposed by communism and particularly its normalized form after 1968. 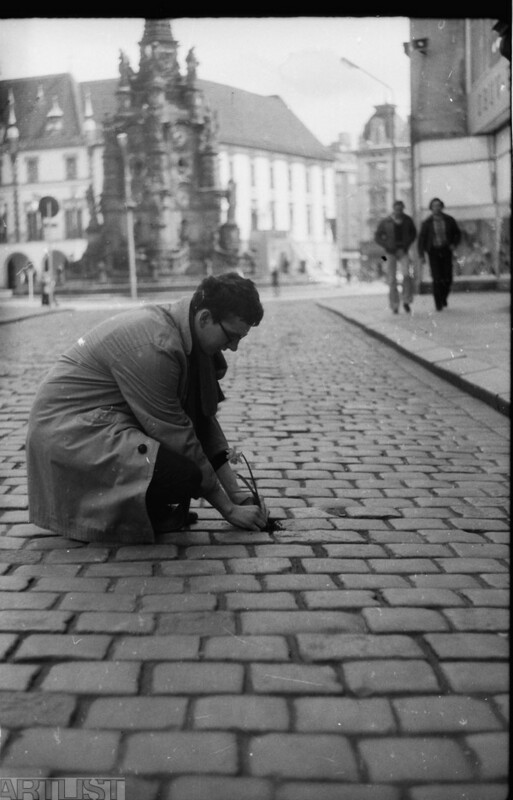 So in the magical city of Kakfa, the Golem, of Kepler, there were disruptions of the everyday with the hanging of empty frames on streets to create fleeting images, cobblestones were replaced by flowers, and Czech artists interrupted the silence of normalization by actions and activity that was often collective. Magic was returned in fleeting moments that only some may have seen, and they may have been amused, bemused, or cheered by these noisy moments that have left no physical traces today, but whose power is not silent, or silenced. Such are the moments that make history. Jaroslav Anděl (curator),“The Poster in the Clash of Ideologies, 1914-2014”, DOX Centre for Contemporary Art, Prague, 14 February-19 May 2014. Liu Xia, “The Silent Strength of Liu Xia” (exhibition), DOX Centre for Contemporary Art, Prague. Exhibition runs from 28 February-9 June 2014. Jiří Hůla (curator), “Pražská imaginace, 1985-2005”, DOX Centre for Contemporary Art, Prague. Exhibition officially ran from 6 March-20 April 2014. Two months ago, I was looking through some files of the Supreme Court of the Soviet Union during the 1920s in the State Archive of the Russian Federation in Moscow. I didn’t find anything of use for my research. I was looking at short notes sent by the Court to the authorities of particular prisons informing them that such a person(s) had been sentenced to be shot, and that they should have the executions carried out. (The death penalty was common around the world at that time, and the Soviet Criminal Code of 1922 suggested it for a number of offences against the state and public order. Interestingly, murder was not punishable by death.) These were then followed by notes sent by the Court to a local morgue to request that the body or bodies be taken away. I was going to reel up the microfilm and move on, but I felt compelled to keep reading. The documents were formulaic and bureaucratic, which was precisely why they interested me. I was looking at the bureaucracy of killing. I’m used to seeing protocols of meetings of the political police whereby lists of people have the word «Расстрелять» (shoot) written after their names, but these documents were more mundane, more ‘real’, and hence more disturbing. Maybe that day, or the day after, a man (these cases concerned men) was going to be walked out to a wall somewhere and his life would be deliberately taken. His lifeless body would fall to the ground, awkward and ugly. The body would have to be taken away and disposed of. I was a witness to part of this process, even after all these years. I’m used to reading about death through the discursive constructions utilized to justify, excuse, and perpetuate it, and that’s basically what my work is about. What I was reading here was the concrete reality of killing and its practicalities, and I was surprised that I had rarely thought about that aspect of Soviet state violence. Violence is an almost permanent theme throughout history, and we continue to live in a time of considerable political violence. We are also now witnessing forms of violence in the 21st century European Union that we thought had been left behind: citizens taking to the streets to protest and finding themselves in conflict with the police. The question that I’m asking here, and to which my response cannot be definitive, is whether instances of political violence can be judged to be right or wrong, justifiable or not. It’s not really a question about history as such, but I would like to bring my perspective to the question as an historian who works on the theme of violence. Let me begin by asserting the legitimacy of the question: the answer is not obvious. We live in parts of the world where the dominant discourse typically (though, importantly, not always) postulates that violence is wrong, and condemns those perceived to be responsible. We assume that peace-keeping and peace negotiations are good things, and should happen. When the ‘Arab spring’ broke out two years ago, the initial reaction of the Western world was to stress the importance of the violence coming to an end, for there to be negotiations. When another deadly round of the Israeli-Palestinian conflict occurred last November, the priority of the world’s powers, again, was for the violence to end immediately, on both sides. Political violence is, actually, very political. Some lives are more valuable than others. I don’t agree with this, but it is an unspoken assumption of international relations and even domestic politics. It appears that electorates in most advanced countries are not overly concerned about this. We need to understand what the term ‘political violence’ actually means. The standard understanding is the infliction of bodily harm on a person, and perhaps also to property, for, or as a consequence of, a political purpose. There is, however, no reason why the definition should be confined to physical actions. Violence can also be considered to be structural, inscribed into the structures of socio-economic and political relationships. The concept of ‘structural violence’ can be traced to the sociologist Johann Galtung, and has been popularized more recently by the well-known intellectual as ‘objective violence.’ Galtung, in an influential 1969 article, argued that the absence of action can also be considered a form of violence when that action is possible, and necessary, to alleviate suffering and death. We all have some idea of the shocking realities of global income inequalities and the scale of poverty and hunger. In 2010, 925 million people were calculated to live in hunger. This situation is perhaps indicative of a subconsciously racialized view of the world, despite all of our overt hostility to racism: the world’s poorest, after all, are not white. Poverty, however, is not ‘natural’ in some social-Darwinist sense. I don’t know how to tackle the problems of poverty, of unequal access to resources and wealth on a global scale, but I do know that they are solvable. We managed to put humans on the moon over forty years ago, and I am sure that we could sort out most of the problems on this planet if the political will were in existence. In reality it’s not, and so the problems persist. If this constitutes violence – and I accept that it is – then who or what is to blame? I’m certainly no expert on this, and the answers are surely complex. In addition to corrupt regimes in some poor countries, a foremost reason must surely be capitalism as it operates on a global scale. In this sense, capitalism kills more people than communism or fascism ever did because it helps to cause or sustain enormous structural violence, although one is not likely to read that in school history textbooks. Capitalism – and the liberal-democratic political forms that allow it to flourish – is more deadly than communism or fascism (though conventional wisdom tells us otherwise). The latter two dictatorial, ‘totalitarian’ political forms are relatively unstable – inherently unstable in the case of fascism – or at least not likely to last for long if sustained violent campaigns are consistent features of their operation. Capitalism as a means of socio-economic and indeed political organization, by contrast, rests to a considerable extent on what the Italian Marxist Antonio Gramsci explained through the concept of ‘hegemony’, by which he meant the ability of the dominant class to represent its interests in such a way that they are accepted as ‘natural’ or ‘common sense’ by society in general. The concept is similar to Michel Foucault’s explanation of how knowledge in any era or sphere is related to power in the form of discursive ‘regimes of truth.’ Living in the capitalist truth regime means that basic concepts of liberalism, private ownership of means of production, free trade, and the (endless) pursuit of personal profit as something to be valued positively, are generally held to be ‘natural.’ Of course, one can read or hear alternative viewpoints all the time, but we’re talking here about dominant ideas in a society. This is not a left-wing rant. I may be a self-conscious socialist (though not a Marxist or any other qualifying ‘–ist’), but I think the above observations are fairly neutral. The reason I make them is to draw attention to the ways in which we perceive political violence, which again can be highly political. Our perceptions of political violence are influenced to a very significant extent by our assessments of those who commit it, as opposed to the actual violence itself. When focus is put on the actual violence itself, regardless by whom committed, our attitudes do tend to change. For instance, the standard narrative of the Vietnam War is that TV and other media coverage of the actual violence effected a pivotal shift in American public opinion about the war. Overall, though, our societies tend to associate ‘crimes against humanity’ with oppressive, dictatorial regimes. To take the most obvious examples, the enormous violence committed by the Nazi and Stalinist regimes are inextricably linked with the persons of Hitler and Stalin in ways that are not rational, even (still) in scholarly works. It’s probably not an exaggeration to state that the general popular explanation of the Nazi and Stalinist phenomena is that Hitler and Stalin were terrible, evil men, perhaps with some personality disorders. By contrast, a political leader like Barack Obama is generally perceived to be very ‘human’, a family man who fist-pumps cleaners (I’m sure there just happened to be a camera there) and plays basketball. He is ‘one of us.’ Despite the increasing disquiet in some media quarters about American drone attacks in Pakistan and Afghanistan and the CIA’s rationalization of these, or the devastating, even genocidal consequences likely to result from sanctions against Iran, it was quite easy for most liberal-minded people to shelve these concerns – that is, if they were aware of them – and rejoice in his recent re-election. Ok, now to try to work out where I’m going with this! Let’s return to the question. I contend that political violence is wrong, but that violence may be necessary under certain extreme circumstances for protection. Political violence is rarely carried out for its own sake, or presented in terms of naked self-interest; it is usually justified by its practitioners as necessary for the salvation of a greater number of others. The Bolsheviks in early Soviet Russia provided the foremost expression of this paradox: we kill the class enemies, declared one Chekist (political police employee), because ‘we value and love life too much.’ The Bolsheviks believed that through violence in the service of establishing socialism, they would help to eradicate violence itself from human relations. The problem of political violence is largely one of moral righteousness, as well as ideological and cultural arrogance: ‘the purpose absolves me of this crime against others.’ We see this consistently throughout history and in our own time. Violence may be effective. However, because violence strikes at the core of our moral being, because the act of severe violence is not assessed in rational, economistic terms by most people – and is actually utterly repulsive to most of us – anything resembling ‘excessive’ violence is not only counter-productive but morally corrosive. Whatever later Marxist theorists of violence (such as Frantz Fanon or even Žižek) might say/have said about revolutionary violence as a means of developing the revolutionary subject’s consciousness, violence (against people) corrodes the ideals of social justice, because it is the ultimate injustice. Yet social injustices form another large part of the problem of political violence: people don’t commit political violence because they are ‘evil’, or simply brainwashed tools of some crazy ideology, but usually because they are acting against some perceived injustice. (The fact that it is probably impossible to reason or negotiate with truly fanatical terrorists who fight for unacceptable causes should not obscure this completely.) This is why the standard calls for peace sometimes seem so empty: we must really examine and address the reasons for violence, insofar as we can and should. Furthermore, we must expand our understanding of violence to accommodate notions of structural injustices, and make this an issue of political weight. Democratically-elected politicians, after all, are obsessed with public opinion. For left-wing revolutionary activists/thinkers and movements today, some of whom aim to re-apply and/or adapt the thought of such figures as Lenin, the question of violence may become an immediate one, if it has not already. Should conflict with the police be encouraged? Should bank buildings be burned down? Should a revolution be physically fought for, come what may? I think not, and I think the lessons of the past bear this out. Violence requires a ‘hardening’ of hearts, and it is not easy to ‘soften’ them again afterwards. Besides, it is much easier to destroy than to replace. The most profound revolutions tend to result from an evolutionary process, because they depend upon changes in ideas and culture. This is where a profound revolution must take place, and academics must play a crucial role in this. Why? Academics are paid to read, think, write, and teach. It’s a privilege, but it also brings responsibility. In some respects I think the discussion in the academic world about open access journal publishing and other means of better ensuring public return on taxpayers’ investment in academia is somewhat misplaced: we must accept that what we write in journals and monographs is not often appealing to the wider public, so we need to complement these bedrocks of academic endeavour with a greater willingness to communicate with a wide public audience through other, more accessible means, and to really adapt what we know and understand to what is currently important. Slavoj Žižek, Violence, London: Profile Books, 2008. Johann Galtung, ‘Violence, Peace, and Peace Research’, Journal of Peace Research, Vol.6, No.3 (1969), pp.167-191. Quoted in James Ryan, Lenin’s Terror. The Ideological Origins of Early Soviet State Violence, London and New York: Routledge, 2012, p.115. See Christopher Finlay, ‘Violence and Revolutionary Subjectivity: Marx to Žižek’, European Journal of Political Theory, Vol.5, No.4 (2006), pp.373-97. See for example Sebastian Budgen et al, Lenin Reloaded: Towards a Politics of Truth, Durham, NC: Duke University Press, 2007.